This Stetson Open Road Cowboy hat signifies a special bond between my father and I. The hat was purchased as a result of the hair loss experienced from Chemo-Therapy. Dad was insistent that I too get a hat so we could wear them together. My hat can be seen in the photograph to the right. We also bought boots to complete the cowboy look. We wore our hats on most all outings, including but not limited to all his trips to his doctor where we were well known as the cowboys. 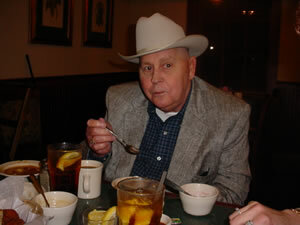 Dad was so proud to wear his hat as it demonstrated his love for Texas where he spent many happy days of his life. 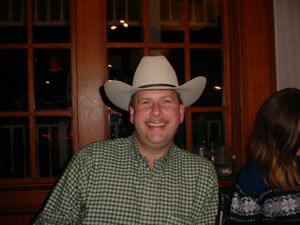 My Stetson is the Alan Jackson Drive series hat. 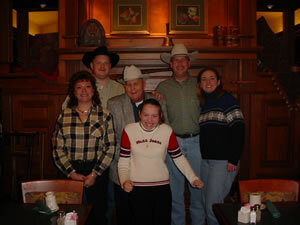 The story behind my hat...On the day we purchased our hats, I had played my newest Alan Jackson CD for my Dad, specifically the song "Drive". I had explained to him that the song reminded me so much of him and my childhood. Inside the western store we tried on various hats, the first hat I tried fit near perfect and so I set it aside. I tried on several other hats of the same size, but none felt quite as comfortable as the first hat. I tried on the first one again, it felt like it was tailored for my head and decided that was the one. 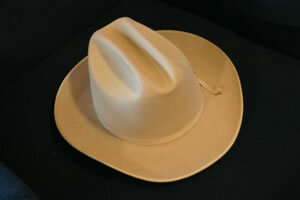 I looked inside the hat to check out the price, saw the label, Stetson Alan Jackson Drive series, I knew that was the one, somehow it was meant to be. I think of him everyday and dream of him often. Although he will be missed more than words can ever say, we were blessed by having an opportunity to spend hours talking and preparing in our hearts, minds and souls. So many folks don't have such an opportunity.